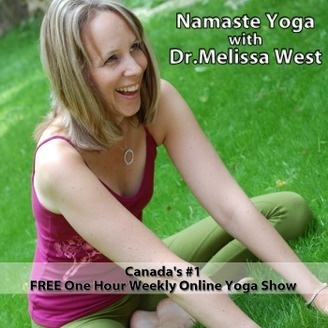 Melissa West is a yoga instructor who helps people to surrender to peace in their lives by connecting to the vital energy within their body through breath, cultivating optimal functional movement by harnessing the power of gravity and increase overall mobility by creating more suppleness in the spine. http://www.melissawest.com/213/ For show notes and pics click here the link above Join our Membership Site: http://www.melissawest.com/membership/membership-info/ Namaste Yoga 213 Hanuman Series Strong like Hanuman an Intermediate to Advanced Class Yoga Postures/Asanas: Cat/Marjaryasana, Side Plank/Vasiṣṭhāsana, Plank Pose/Uttihita Chaturanga Dandasana, Hanuman/Lunge pose/Anjaneyasana, Dolphin Pose/Makarasana, Chair Pose/Awkward Pose/Powerful pose/Chair Pose/Utkaṭāsana, Goddess Victory Squat to Side Angle, Utkata Konasana to Parsvakonasana, Side Plank to Wild Thing Pose/Vasiṣṭhāsana to Camatkarasana, Recline Twist/Jathara Parivartanasana, Easy Pose/Sukhasana with mantra Rama Props Needed: yoga block, blanket Hanuman is a mystic being that is half-human and half-animal, a type of God in the Hindu pantheon known as a Kimpurusha. Kimpurusha means ‘ is it human’ referring to being superhuman. Although Hanuman is super strong, his strength came from the repetition of the powerful mantra Rama. This mantra is said to give liberation from the drudgery of mortal life. Hanuman is described as the world’s first superman. He accomplishes feats of amazing strength in his life. . As we learned in episode 211, on monkey mind, Hanuman has perfect mastery over his mind, but he also has the most developed body. He is sometimes called Bajrangabali - one whose body is like a thunderbolt and whose movements are like lightning. Hanuman is so strong that he can lift mountains. Since Hanuman is so well known for his strength he is known somewhat like a patron saint of physical culture. His image is enshrined in gymnasiums all over India. It is said that one who meditates on Hanuman will attain his power and strength. Many of the physical characteristics of Hanuman also display his strength. His tail arches upwards which is a symbol of his strength, agility and virility. He wears a only a loincloth, just like wrestlers and bodybuilders. He is usually shown standing guard holding a mountain in one hand again displaying his strength. Namaste Yoga 210 What is Advanced Yoga?